As an en plein aire artist, I know a lot of people enjoy seeing a painting in progress. The general public usually isn’t sure if its okay to approach an artist or not. Will you bother them? destroy their process? ruin their work? approach the artist from the side, stand in their peripheral vision so they can see you but don’t block their view. don’t walk in front of the artist when they’re painting. if the artist ignores you, don’t bother them. if the artist looks at you and nods, then goes back to work, wait and see what happens. Most artists that you see out painting are self employed and will be happy to talk to a potential customer about their art. Sometimes I wish the public would see artists painting ‘en plein aire’ in a public place as performance art. After all, that’s what it is. Nice comments are good, but how about a tip? I would like to see people develop a habit of tipping ‘en plein aire’ artists when they stop to watch. Just throw a buck or two in their paint box. You can be sure we’ll appreciate it. I have seen artists that make painting a picture into performance art. They’re usually not painting the view, but a pre-composed painting. Its even become common for artists to paint a picture to music in a nightclub, although these paintings are almost always abstract. This artist is incredible, he makes painting into a real performance and people pay lots of money to watch him. Thanks for the great post! 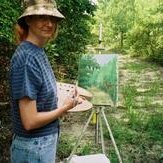 I want to encourage more artists to paint in plein air cause it’s been great for me!